I recently acquired a double French Bread pan from Bread Beckers and I am very excited about it. I’ll be sure to update this recipe with a proper pictures soon. I use French Bread to make garlic bread, and travel sandwiches. This recipe makes a light loaf that is just the right amount of crispy on the outside and soft on the inside. Place in a greased bowl turn to grease top. Cover. Let rise in a warm place for about an hour. Punch dough down and divide in half. Roll each half into 12 x 15 inch rectangle. Roll tightly from longest side. Tuck ends under. Grease baking sheets and sprinkle with cornmeal. Place the rolled dough on baking sheet. Cut small slits diagonally in the top. Cover and let rise for about an hour. Bake 450° degrees F for 25-35 minutes. Bread is done when you tap it and it sounds hollow. How to knead dough by hand: Click here for a Youtube video with detailed instructions on how to knead dough the artisan way. I’m new to your site, but already I’ve suggested it to 10 friends! I tried this recipe last night and it was a hit in spite of the humidity (I live in Florida). All of my friends think that bread making (really, making anything home made) is just too hard, but this recipe proves that idea completely wrong. I’m a full-time student and part-time employee and even I can find time to cook for my dear husband and myself. Thank you for sharing you story with us and may God continue to hold you in the hollow of His hand. Thank you so much for your comments and for your feedback! I’m so glad you found my site! I just made your bread! clearly I need help on the shaping part, but it looks good! if i didn’t just eat a whole bagel id try some! 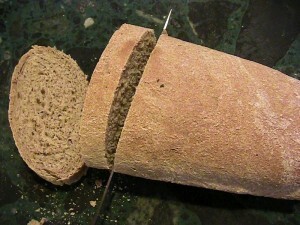 I am making several loaves tomorrow to have for travel sandwiched this weekend! I’m definitely new to bread baking, can I add wheat flour? I didn’t know … usually in like pizza dough and banana bread I use half and half, is that a good ratio for bread that needs to rise? Thanks! I typically make it with all whole wheat. You can add as much as you like. Just watch your moisture content. You might need to up it slightly. I have made it twice now. Big thumbs up from us! This time, I made half the dough into one big loaf and split the other half into thirds (yup, that’s a lot of math) to use for sandwiches. I use a Misto to make my own spray for non stick spray and love it! It came out a wee bit dense – still edible, but not like it should have. And my dough was the slightest bit sticky, but not too much. Would you recommend adding water? Are you using a stand mixer? I am indeed … ? If it was a little sticky, you didn’t need to add more water. It shouldn’t be TOO sticky. I have had to add water in the past, but only slightly. It could have been environmental. It could have been your yeast or the temperature of your water. It could have been a number of things. Using a stand mixer, it wouldn’t be how you kneaded it or if you kneaded it correctly – you just kind of put the ingredients in and turn it on. I do the exact same thing every time, and 9 out of 10 times, I have a perfectly light bread with a crusty crust. Then there’s that one time that it just doesn’t come out. Are you using the same yeast? Yes, the same yeast. But it’s new, I’ve been keeping it in the fridge, and it does proof. The bread rises well the first time …it’s usually my second rise that’s tricky. I’ve read all the articles, but still not had much luck. I’m about to buy a bread machine! I wish I was there where I could touch it and see what you’re doing. If it’s rising the first time, it must be something you’re doing when you form the loaves. I’m sorry that I’m no help. Okay, I’ll have to keep working on it!